Validated parking available at the Fisherman's Wharf lot located directly behind our building. Entrance on Taylor St. (past Jefferson).2 hour validated parking with arrival time before 6pm, 3 hours validation with arrival time after 6pm. Be sure to have your ticket validated before leaving the restaurant. The MUNI "F" Line drops passengers off directly in front of Boudin at the Wharf on Jefferson Street (between Mason and Taylor Streets). 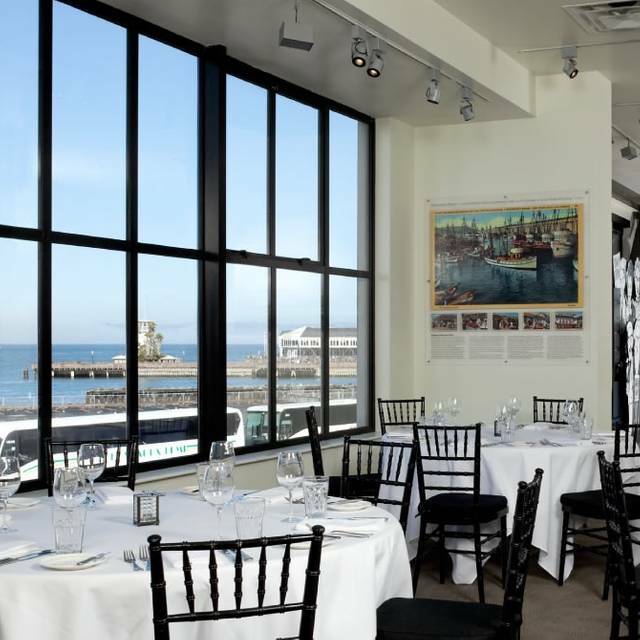 We offer both private and semi-private dining with several diverse and versatile space options, each with stunning bay views and crowd pleasing imagery. 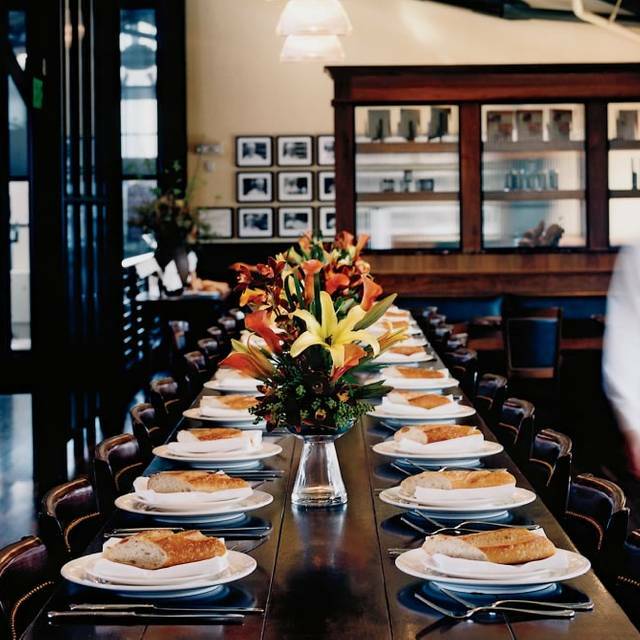 Our private dining room also offers a 52″ HD Monitor with satellite capability and direct VGA laptop connectivity. 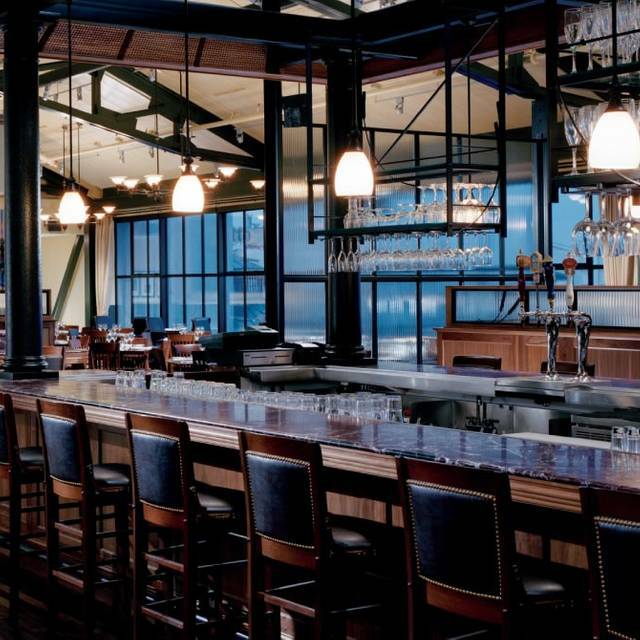 Located on the upper level of Boudin at the Wharf, Bistro Boudin offers an ideal place to enjoy a leisurely meal with views of the SF Bay. 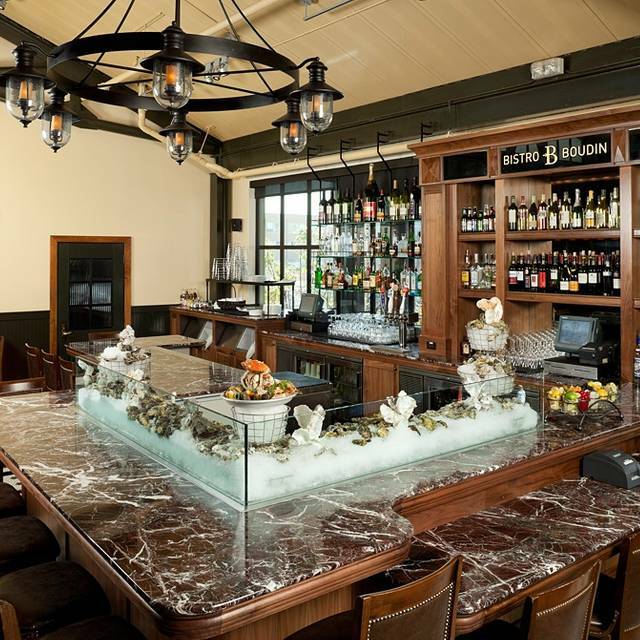 Warm and inviting with beautiful dark wood accents, Bistro Boudin features a full service bar, Oyster bar and spectacular views of the waterfront. 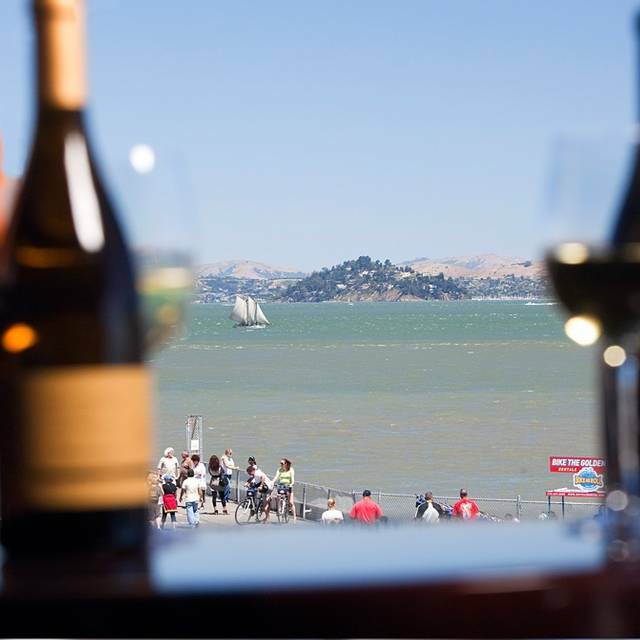 The menu is influenced by the abundance of seasonally fresh foods available in the San Francisco Bay Area and the restaurant is open for lunch and dinner. Awesome Place, Awesome food , Awesome service. The view of the ocean , Alcatraz in the back and the boats is very nice. The food is as always amazing , the Iceberg wedge salad is just the right side and the Dungeness crab cake were the best ones ever. As for the dessert there was lots of good ones, we had the cinnamon-sugar dusted sourdough beignets a must they are to die for. The service is awesome as well as the seating area. It is always busy but not loud as the rooms are quite spacious. A must on the places to go while in San Francisco. 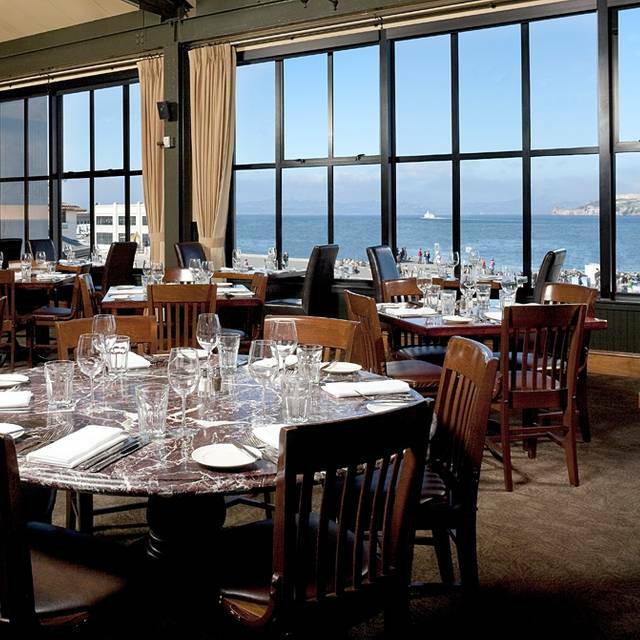 With an amazing view out to the Bay, and awesome industrial interiors and comfortable seating options, our meals and conversation make for an enjoyable experience. The food selection is outstanding as there is something for everyone, and every level of appetite. And if something goes a little awry, staff is quick to make it right and sustain that enjoyable meal. Fun place to eat at the wharf. The museum and bakery are beautifully presented, but there's better food elsewhere. Service was slow. Good just okay and expensive. Food was great and ambience always great. Service was a little slow. Had to ask twice for missing cole slaw and ketchup. We told the waitress who brought the food but she forgot and so we asked a waiter and he brought it. Just Meh, a Typical Tourist Trap in an otherwise Fun Area. This was our bad. We didn't plan well, lots of better restaurants were closed (for dinner on Sunday, WTF? ), and should've just gone to one of the many food trucks or food carts nearby. This place phones it in with lackluster entrees and a staff that just seems to hate their work--I don't remember anyone smiling at us while we were there. They start you off with their slices sourdough bread and frozen butter. Why do they think frozen butter spreads on soft, white bread? Why not bring it up to room temperature for the lunch and dinner rushes? I would think a bread place would know how imperative butter is to bread. I ordered their Boudin Sourdough Claim Chowder Breadbowl ($17). The chowder was boring and flavorless. Good chunks of clam, but the soup had little going for it--you need to add salt and pepper to get anything out of it. Also, they way they pulled the middle out, to form the bowl, was sloppy and left a lot of white in the bowl--so I lost about a quarter-cup of soup. My wife ordered the Dungeness Crab Cake Sandwich ($22). She wasn't a fan--not a lot of flavor, despite the crab tasting fresh. She thought paying a premium on a sandwich should yield a better tasting sandwich; who could disagree? Lastly, the fries were cheap and just bland--how can you mess up fries? The kids ordered off the kids menu and went with a cheeseburger ($12) and pizza ($12). The burger came undressed with no toppings and condiments on the side. Why? That's just lazy. They served ketchup in ramekins and brought out little sealed containers for dijon mustard and fancy mayo? Again, why? That just creates a lot of waste and does no one any good. I can't recommend this place to anyone for lunch or dinner because there are a lot of other great places in walking distance (if they are open) and ordinary folks hustling on the streets with trucks and carts, serving flavorful street food. 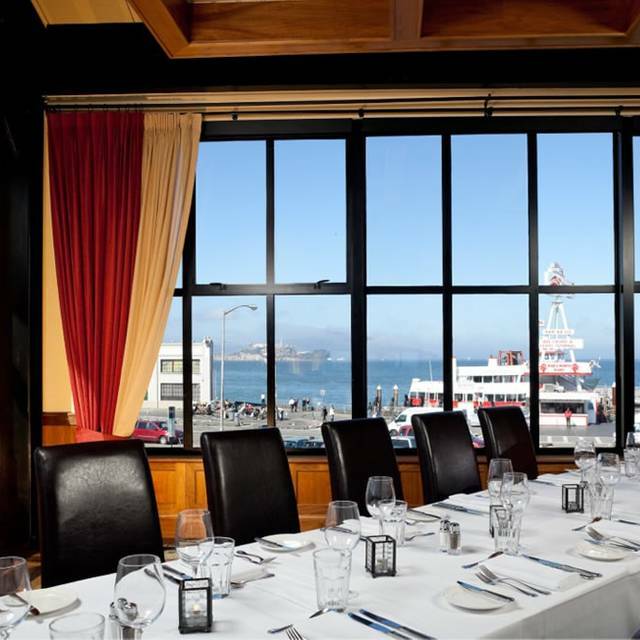 The restaurant sits above Pier 39 and has a view of Alcatraz. Our waitress was very friendly and helpful, but delivery of the main course was a bit slow for unknown reasons. My wife had a salmon dish that, given the price, was rather small. My ribeye steak sandwich was delicious as was the clam chowder I ordered as a side. Overall, it was a good, but not great, experience. Food was good. It was a fun place. Nice view. Wish we would have eaten downstairs. A thoroughly disappointing experience. The food was basic, poorly presented and over-priced and the service could be described as disinterested at best. Definitely one to avoid. The crab and corn bisque sour dough bowl was very tasty and the sour dough is delicious on its own. Service definitely could have been better. Felt more like the server was annoyed that we only ordered the sour dough bowl soups and no appetizers. Then when he asked us if we wanted dessert, we said not right now but maybe in a little while. So he brought us the check 1 minute later and said if we want dessert, just let him know and he would put it on a separate check. I just got the feeling he wanted us out of there and it wasn’t even that busy. My friend was visiting from Australia and I hadn’t seen him for 4 years so we had a lot to catch up on, I guess this isn’t the place to have any long conversations. I always like to dine here when in town. I strongly recommend the scallops. We had family visiting from Brazil so we enjoyed taking them to the famous Boudin. Food was good and view was perfect, even during yucky weather. Food over cooked. They acted as though they would have rather we not be there. I ordered the surf and turf. Lobster tail the size of a prawn and very rubbery due do over cooking. My filet was ordered medium rare and came well done. My husband became sick 10 minutes after leaving. Only decent thing about the meal was the company I was with and the sour dough bread. Good, tasty food, although a bit on the pricey side. Service was so-so. It took a long time for our waiter to return to the table after the initial greeting. The noise level is much less than a lot of restaurants these days, so that was nice. 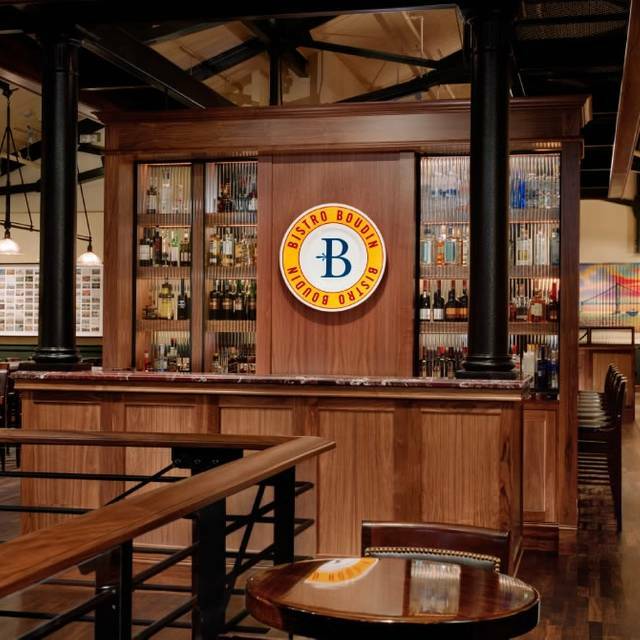 Bistro Boudin has a great menu....from soup and sandwiches to dinner entrees. The wait staff is friendly and professional. Wonderful views of the bay. And it is quiet! You can converse in a normal voice! Such a pleasure. We were seated very quickly, the service was good and the food was AMAZING. Thank you, Open Table! Always take my out of town guests here - the food, service and atmosphere are always great. Of course the primary reason is the bread - the best in town. It has a lot of potential but with the amount of tourists with bags and T-shirts’ you feel rushed and too expensive for quality of food and service. People queuing for restrooms while you are eating is very off putting. We enjoyed a great lunch on Presidents Day weekend. We were seated at a table with a beautiful water view. Our server was friendly and helpful, suggesting that a combination of seafood tacos might be to our liking. We also enjoyed the petite boule with yummy clam chowder. Would definitely come back. The view is outstanding. Our seating host was quick and efficient. Calamari appetizer very nice! My husband's Halibut entree arrived cold & had to be replaced. Our server did not offer my husband an apology or drink or anything while he waited. The timing threw off our dining experience. My drink was empty for a long time and I was never asked if I wanted another, which I did but did not get a chance to order. I had to request water, which was never refilled. The other entree's were OK. We were never asked if we wanted dessert or coffee, which I would have ordered. We were extremely disappointed by the subpar service. Will dine elsewhere for dinner. This was a special occasion for me and my dining companions and it was marred by the lack of attentive service. In my experience, lunch here is a much better experience. We have been to this location several times. We were seated right away. Waiter was excellent. Long wait for food (waiter apologized). Hot food was cool when served. Nice dinner with important clients. Upstairs is much quieter than downstairs. Busy place but loves the crab cake and corn salad. Worst experience ever in a restaurant!! General manager not only refused to diffuse our poor service, food, and billing issues l, but cussed our group out in front of a packed crowd. I’ve disputed the charge with Amex and am considering perusing legal recourse. We had an awesome dinner, and really enjoyed the views from our great table. Thank you. Great food and service. Loved the sourdough bread. 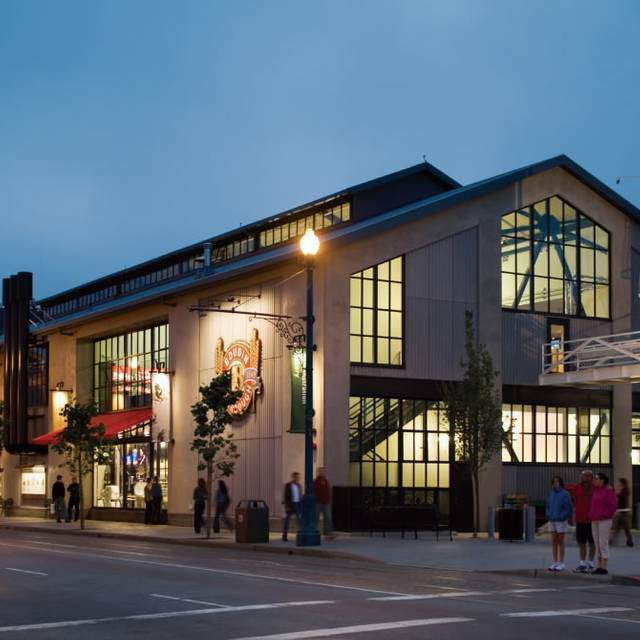 Prices are average for Fisherman’s Wharf - might seem pricey elsewhere. While the food was good, we heard too much clanging from the kitchen area and we were across the dining room from it. The waitress did not bring water until we asked a 3rd time. The waitress did not ask us how the food was or check on us regularly, even tho it was not overly busy. She did not ask to fill our wine glasses when they were empty, as we had bought a bottle. We had to ask. The prices were higher than expected. Had a wonderful experience At Boudin's Bistro. I like to eat so I was a little wary about my portion size for the scallop dish, three scallops seemed a bit low but it ended up being perfect. The taste was amazing . the scallops were tender and not rubbery at all. The pork belly was delicious and unlike others didn't have tough parts. The service was excellent. I would highly recommend it for colleagues or loved ones. Not your typical wharf restaurant -- view from their upstairs restaurant is of the street; not typical waterfront lookouts. Prices were high; portions did not reflect. Exception was the mussels; quite tasty and several of them marinated with a piping hot cauldron. Rest of the menu items ordered were average. We thought our server deserved credit. She maintained her section completely on her own. No busser in sight. She remained composed and never let on that she may be in the weeds. Final note -- if a particular dessert item is only made until a certain time; it should be stated on the menu.